As U.S. policy is debated and challenged, Anchorage-based Catholic Social Services looks out for clients and looks for opportunities. 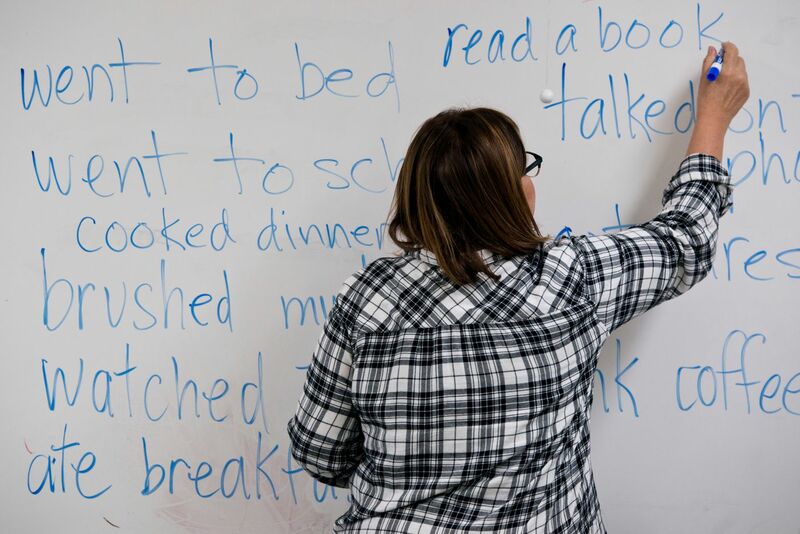 On a Saturday afternoon in early February, Jessica Kovarik asked for the attention of a classroom full of adult refugees living in Anchorage. It was the end of a tumultuous week for a program that helped bring them here, and assists them still. The group had come to the Catholic Social Services building on East 20th Avenue for a monthly class on how to help their children achieve in school. 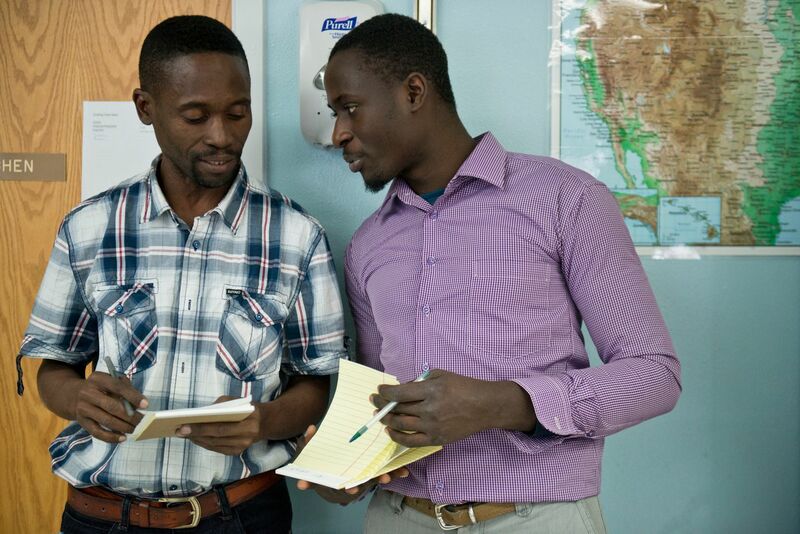 On that day, Kovarik, director of the Refugee Assistance and Immigration Services program for the nonprofit agency, had other matters to discuss. She wanted to explain what she knew about President Donald Trump's executive order on immigration and refugees, as unsettled as the matter seemed. But first, she tried to ease her clients' minds, to let them know they were still welcome, despite the razor-wire rhetoric they may have heard and protests around the country they may have seen. Did they remember when they first arrived in Alaska? Did they remember clothes and household items donated to them? "It didn't come from me," she said. "It came from the community." Kovarik walked around the room, making eye contact with her clients for emphasis. She tried to reassure them that police would still assist them in the event of an emergency. "You still are all here legally, and you still all have protected status," she said. Kovarik paused after each sentence to allow translators at each table a chance to relay the message. Murmurs in Somali, Nepali, Burmese, Spanish, Swahili and Arabic filled the room. Next came a crash course in U.S. civics for perspective on what was happening and what had already changed. The order put a hold on refugee resettlement for 120 days, people like them who were next in line. "So, already, the system has stopped," Kovarik said. "It stopped on (Jan.) 25th, which does have impacts on our program and our ability to help your family members get here." The listeners focused on their translators. A woman in the back of the room cried, holding her hand over her mouth. "We really, really, really hope that the system starts up again soon," Kovarik told them. She spelled out the branches of U.S. government on a dry-erase board. Tara Rich, legal and policy director for the American Civil Liberties Union of Alaska, joined her in answering questions about the separation of powers. The court branch can decide if the executive and legislative decisions are unconstitutional, they explained. All branches must serve the U.S. Constitution. That was the discussion underway in America's legal system regarding Trump's order. "The beautiful thing about this country is that it's not run by one person," Kovarik said. Still, a simple question proved difficult to answer that day: Would they be allowed back into the U.S. if they left? "My best advice, and immigration attorneys right now are saying, don't leave the country if you don't need to," Kovarik said. Ahmed Omar, who had been translating for Somali people, relayed another concern from his table. Could someone be deported for, say, a minor traffic infraction? "There are only certain crimes that have immigration consequences, so you cannot be deported for simply running a red light," Rich said. Hari Kafle, a RAIS case manager who had been translating in Nepali, followed up. "What about if the legislative, or the Congress, agrees with what the president is doing? Can the courts stand against both?" "Even these two together cannot violate the Constitution," Rich said. Much was yet to be determined, Kovarik said. "I think the main point of this too, is that all of this isn't finished," she said. Kovarik knew change was probably coming in the months leading up to the new president's order. Still, it was gut-wrenching to read its final version, she said. RAIS expected to help about 100 people move to Alaska this year through September. The long process was nearly complete for 78 of them. 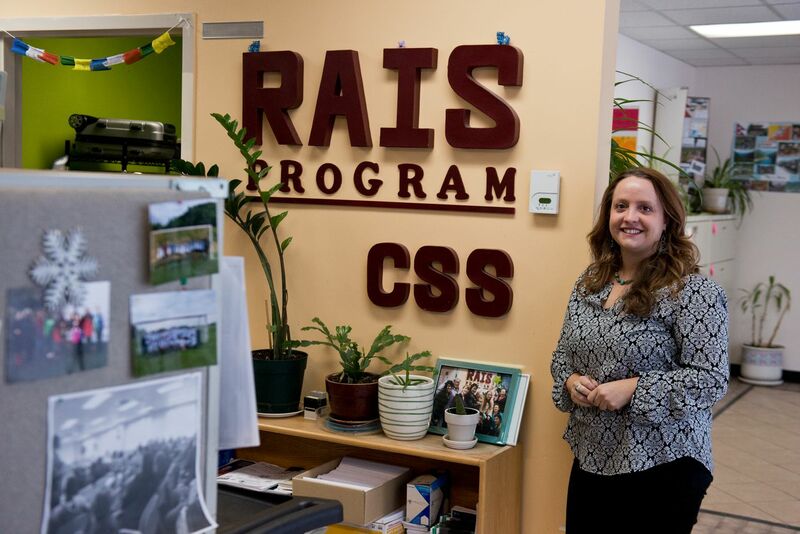 CSS began helping refugees resettle in the 1990s but expanded its services about 10 years ago. 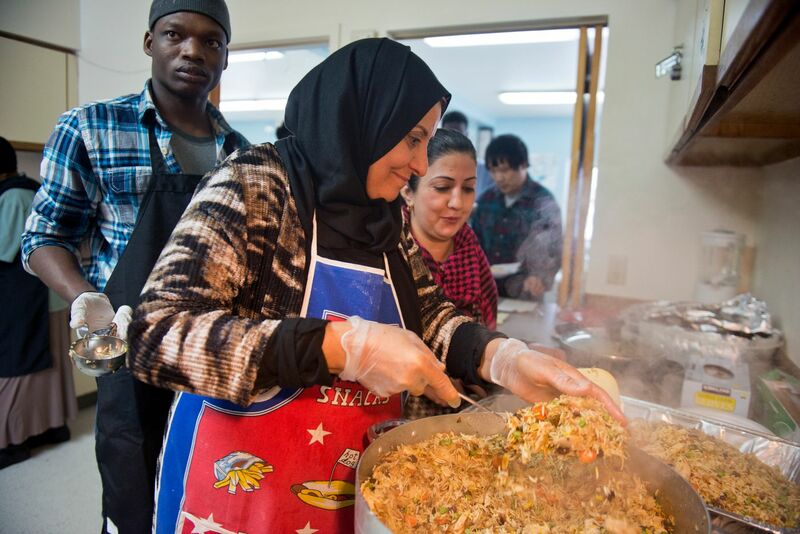 The RAIS program also offers case management, education and job training with the assistance of AmeriCorps, and been instrumental is bring about 130 refugees annually to Alaska in recent years. That's a small fraction of number of refugees resettled in many other states. The White House justified the travel ban as an effort to institute stricter vetting of immigrants as a defense against terrorism. From her office in a one-story cinderblock building in East Anchorage, Kovarik said the system that had been in place was no shortcut. In fact, odds were already long for any refugee to get the chance for "third country resettlement." It works like this: The United Nations High Commissioner for Refugees, the international body mandated to protect and assist displaced people fleeing conflict and persecution, counts 21.3 million refugees worldwide. Most remain hosted by the nation the refugees fled to, in camps or cities. The top host nations are some of the world's poorest. In these places, refugees register with the UNHCR, which assesses resettlement eligibility and makes referrals to other nations. Embassies and nongovernmental groups occasionally make referrals, as well. The U.S. sometimes grants special immigrant status for people who face an ongoing threat for assisting the U.S. government overseas, or who worked as translators for the U.S. military in Iraq or Afghanistan. Less than 1 percent of refugees are ever offered a chance to resettle. "It's like winning a lottery to be given that opportunity," Kovarik said. Those who are selected don't get to choose where they go. More than 30 countries accept refugees for resettlement, according to UNHCR. Those referred to the U.S. State Department must pass a screening process that typically takes 18 to 24 months and includes a review by several U.S. agencies. The State Department then works with a group of nine organizations that place refugees nationwide. Anchorage' Catholic Social Services, is an affiliate of one the nine organizations: The United States Conference of Catholic Bishops. CSS is the only agency in Alaska that helps refugees resettle, nearly all of them to the state's largest city. Volunteer agencies make a special effort to reunite family members, Kovarik said, but there's no guarantee. When possible, orphaned children reunite with siblings, and elderly parents join adult children. Sometimes a spouse, who left first, is rejoined by a partner and baby who follow behind. RAIS had 48 individuals with family connections "in the pipeline" to come to Alaska when the executive order was signed. Those families have been hit particularly hard. "They were so close," Kovarik said. A four-month hold on resettlement, Kovarik said, would involve more than what meets the eye. In four months, many people who had been "travel-ready" in February will have expired documentation and screenings by that time. "So, they have to go back to the beginning," she said. "And back to the beginning could mean another two years." Meanwhile, wars rage on, and the number of people fleeing their homeland increases around the globe. "We now have 21.3 million refugees in the world, and it is dramatically increasing each year," Kovarik said. "The conflicts are not stopping." A week after the informational meeting, the RAIS classroom had been transformed into a mock-restaurant called the Global Cafe. 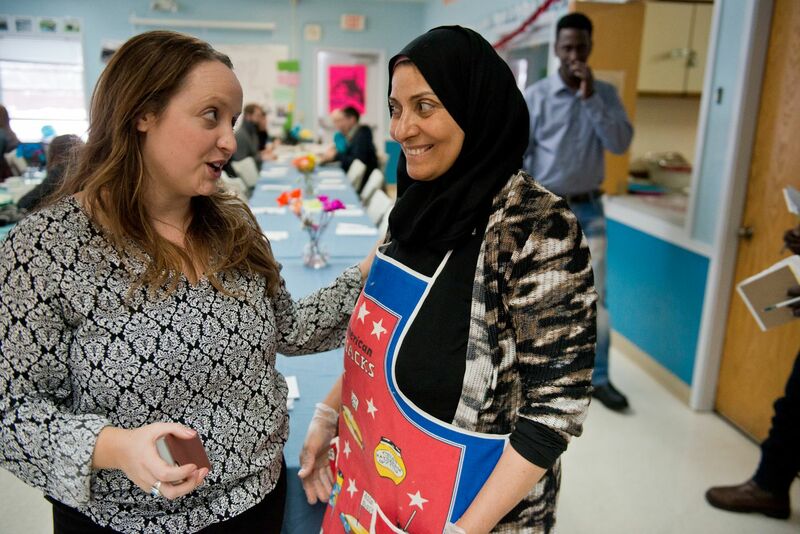 Ten refugee clients operated it, offering a biryani, a rice dish, for $3 and baklava for $2. Clients practiced as cooks, hosts, waiters and cashiers. 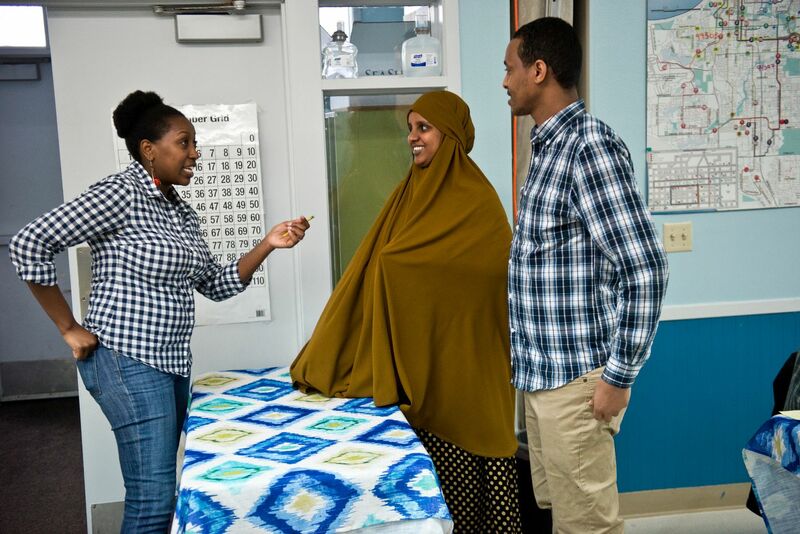 Erisa Maombi, 23, and Salim Amadi, 40, two of Anchorage's most recent refugee arrivals, consulted each other as they waited tables. Both men, who came to Anchorage in December, laughed and smiled often while they worked. Maombi, from the Democratic Republic of Congo, who came to Anchorage from a refugee camp in Uganda, said he's adjusting to the weather. He noticed that sometimes when it snows, it's not very chilly, but when it's clear it can be bitter cold here. Between restaurant orders, Maombi explained he left Congo for the refugee camp when he was just 3 years old, and spent two decades in Uganda. It was a life of hunger and poverty for many people, he said, and a place where it was even difficult to know what's happening in other parts of the world. Life in Anchorage is so different. "Our life in Africa was not like easy, but here someone can stay in peace, harmony, with all your rights observed," Maombi said. As fortunate as he feels, being here is bittersweet. He hoped one day his older brother, Silver, would join him. "I'm happy because I'm here, but I also sympathize some with our colleagues who remain there because they're not living in good conditions," Maombi said. "So, I will be more happier when they also get that opportunity to arrive." Amadi also left family behind. He's from Somalia, but had been in Kenya since 1992 when he escaped civil war by boat. His parents, however, did not. "My birth parents all dead. Both of them dead. I escaped with my sister, and on the way she got lost, so now I don't know where she is," Amadi said. 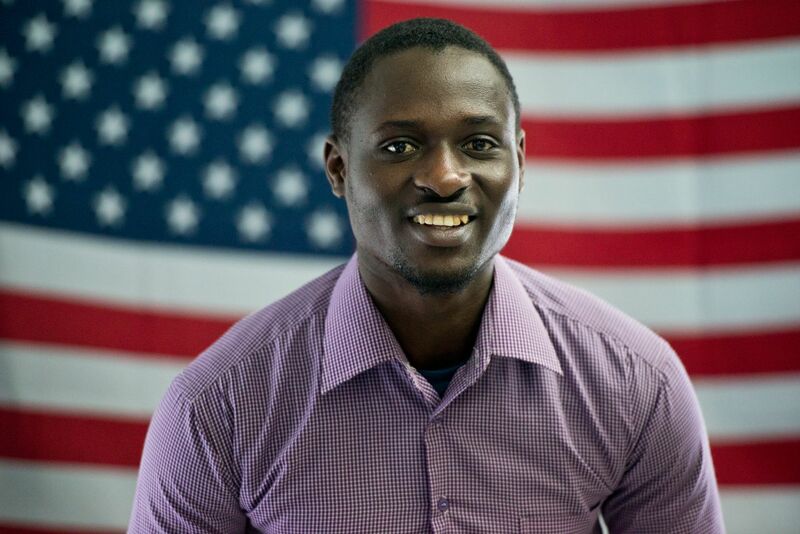 Amadi spent several years in the Kakuma refugee camp (population nearly 155,000), and worked as a mental health care assistant before having the opportunity to come to the U.S. He called it a "golden chance." "I witnessed over there in the camp, others they did their interview, and at the last (moment) they get reject(ed)," Amadi said. Amadi left his fiance and 1-year-old daughter at Kakuma with hopes that they'd soon be able to join him in Anchorage. It's hard to know if that will be possible now, he said. He communicates with his fiance through a texting app, and she has been sad and stressed at the changing situation. He's trying not to lose hope, he said. Kovarik watched her clients work from the side of the room. She hadn't had many days off in recent weeks. Each day she tries to figure out where things stand, and how her clients and 17-person staff will be affected. "To us, it's not a number," she said. But the numbers being discussed are hard to ignore. One facet of the president's original policy aimed to cut the number of refugees admitted to the U.S. by more than half, and that's not a detail being contested in court, she said. "There are impacts that will come later on down the road. It's just hard to know exactly what they are," Kovarik said. That week, a three-judge panel of the 9th U.S. Circuit Court of Appeals declined to reinstate the executive order, which had been blocked by a lower court earlier in the month. What that means for RAIS is hard to say, Kovarik said. 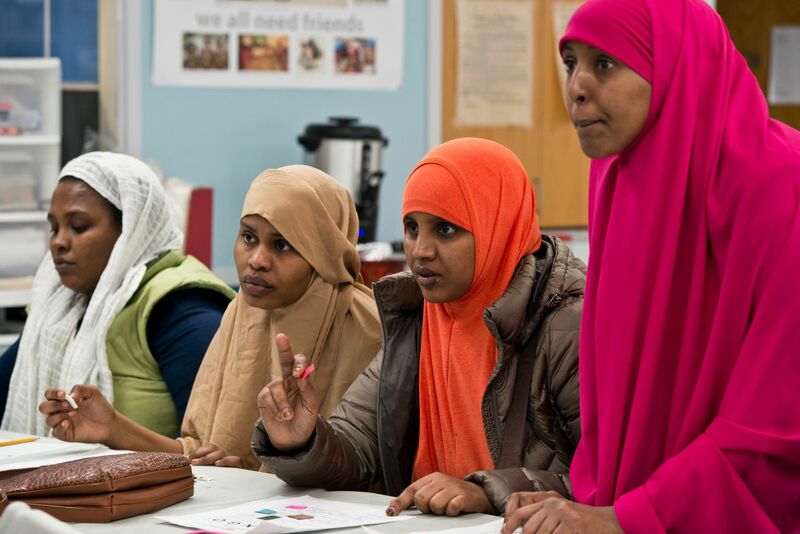 Refugee resettlement is not a system that can turn on a dime. But as volatile as the discussion about refugees seems to have gotten lately, Kovarik also has a good problem to contend with. The number of volunteers who want to work with RAIS has ballooned, from about 40 to more than 300. 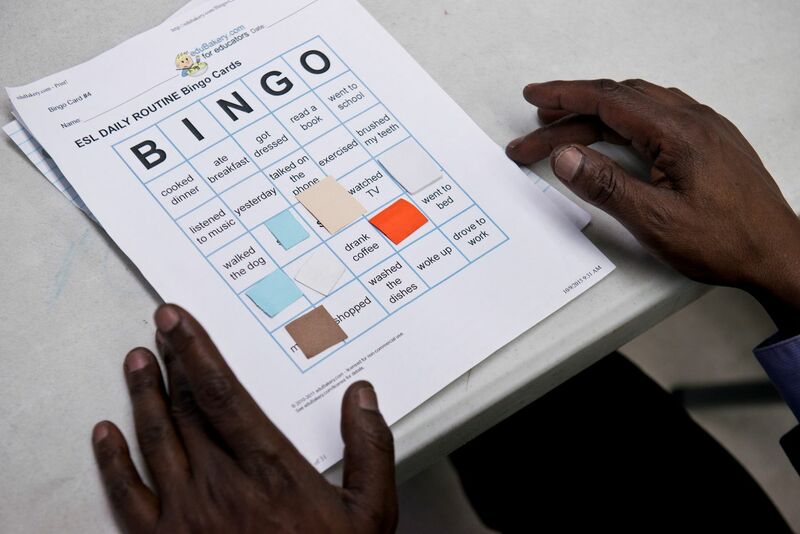 About 150 applications came in this month, as did offers of housing and employment help. 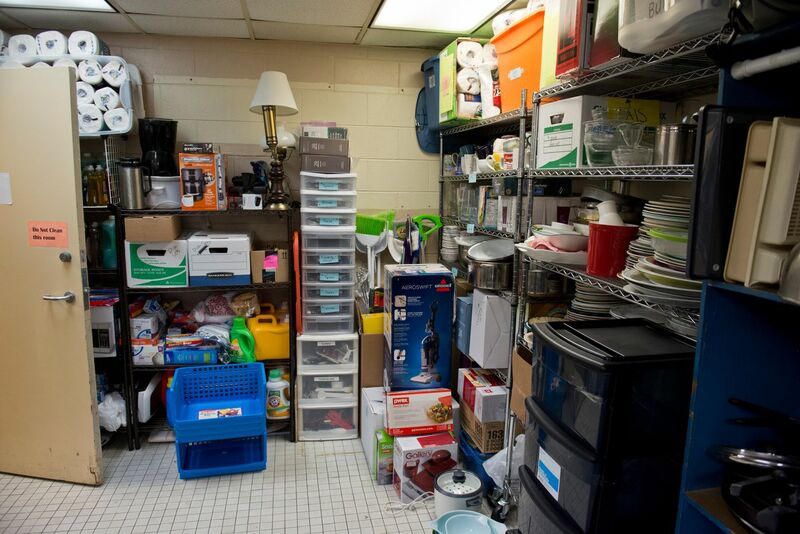 Donations of clothing and household items fill storage rooms in CSS headquarters. The show of support inspires her to be as resilient as her clients, who have been through so much already, she said. "It gives us the courage to stand up again and say, yes, this is what we do and we're here. We're here to stay." 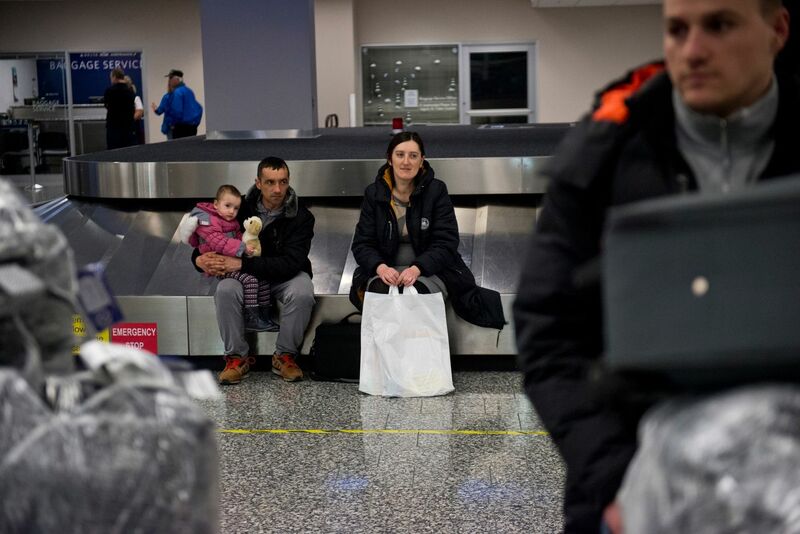 On Thursday, four Ukrainian refugees emerged from the gates of Ted Stevens Anchorage International Airport into the arms of their brother who lives in Wasilla. They are the first refugees to make it to Alaska since Trump's order was signed, and might be the last for several months. The president has promised to issue a revised order to put resettlements on hold again. 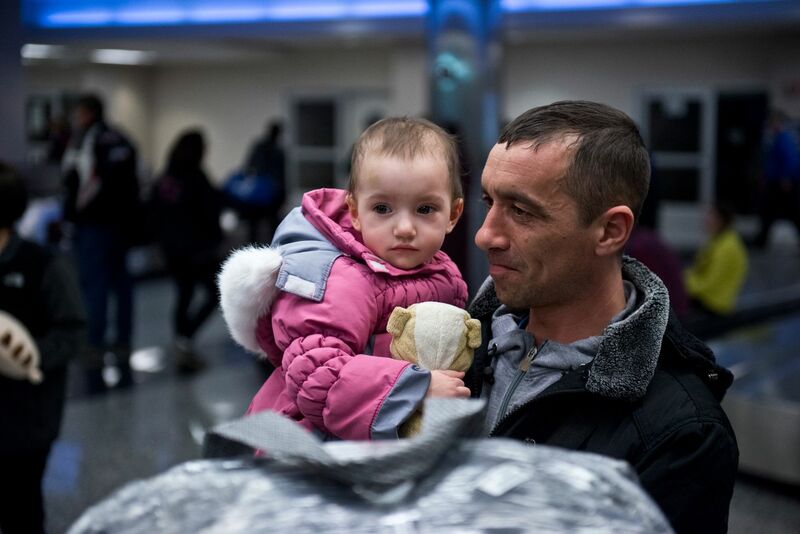 Anna and Mykhailo Trashchuk sat down on the edge of the baggage claim carousel, exhausted from the three-day bus and plane journey from western Ukraine. Their 2-year-old daughter, Diana, hugged her stuffed dog, Bowwow. Anna's brother Volodymyr Kharyton, 25, leaned on the luggage carts as his brother Dimitry Haritone fetched his vehicle. Unlike the vast majority of refugees who come to Alaska, these four came through a policy known as the Lautenberg Amendment. First introduced in 1989 and re-enacted several times since, the amendment makes it easier for some religious minorities to escape persecution from the former Soviet Union and elsewhere. Kovarik said seven families, totaling 37 people, have come to Alaska since 2014 due to the amendment. As a Baptist, Kharyton felt like he had to hide his faith in Ukraine, he said by way of his sister-in-law interpreter, Samantha Haritone. He also feared being drafted into military service. Fighting against Russia in eastern Ukraine would go against the teachings of his faith and he feared prison was the alternative if called. Kharyton and the Trashchuks had already given up their jobs and sold some of their belongings in preparation for the move to Alaska when the president's order cast doubt. 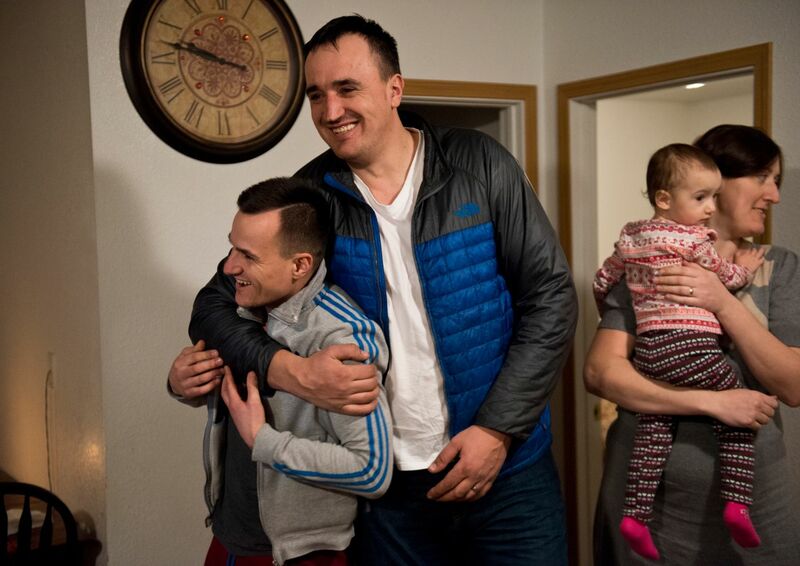 The call for a 12-week hold on all resettlement would've meant the Trashchuks' second child would be born in Ukraine, a status change that could require them to start the yearslong process anew. Kharyton says he feels fortunate to have made it, and looked forward to a life in which he feels free in his religion. "The immigration service said, 'It would be a miracle if you fly to the United States,' " Kharyton said through RAIS resettlement coordinator Luba Belavtseva-O'Hare, who translated at the airport. "And the miracle happened." They loaded all their possessions, packed into just nine bags, into Haritone's pickup and hit the road to begin their new life in America.